Fans might expect that the design length of 467m of this widespread Starfleet ship class should be well-established. Still, there are some reasonable doubts about this figure. Some of the various available facts points to a considerably larger size of the Excelsior. Progressive estimations for the length rise up to almost 700m. Various pieces of evidence are investigated in the following, taking into account all versions of the starship which can be assumed to have identical general dimensions. Actually three different Excelsiors could be seen on screen, not counting the various kitbashes or study models. 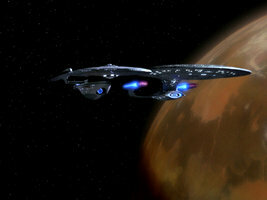 The first was the original USS Excelsior NX-2000 which was later slightly modified and became Sulu's NCC-2000. This ship was supposed to be 467m long so far. The Enterprise-B from "Generations" and the Lakota from DS9: "Paradise Lost" are of the refitted type with hull extensions on either side of the deflector, additional impulse engines, new Bussard collectors and extra fins on the nacelle rear ends. The latter increase the length of this sub-class to about 469m. All variants are overall 184m wide and 78m high. 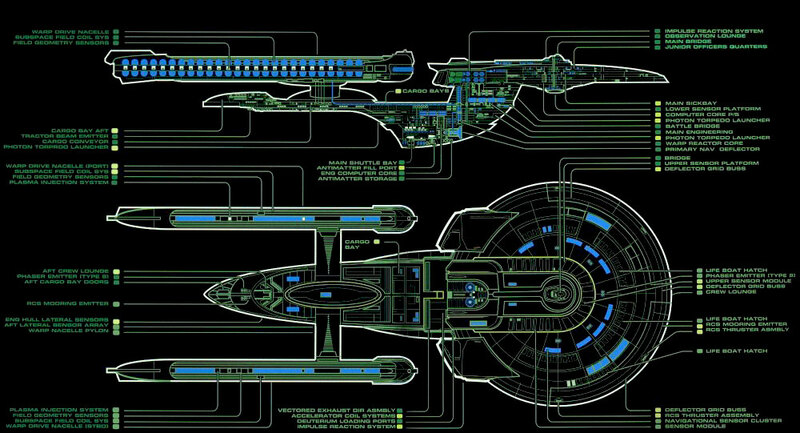 The ILM size chart created by Nilo Rodis for the vessels in "Star Trek: The Search for Spock" nails down the length of the Excelsior class at 467m. Still, other ships from the movie like the Klingon Bird-of-Prey, the Oberth class and the Merchantman have quite debatable sizes. So it may be permissible to question the dimensions of the Excelsior likewise. 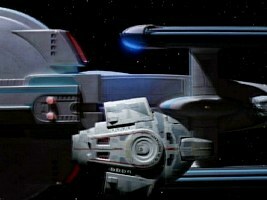 The overall length of 467m, however, was consistently transferred to Andrew Probert's size comparison for Star Trek: The Next Generation, indicating that the people in charge of the design never changed their minds about it. 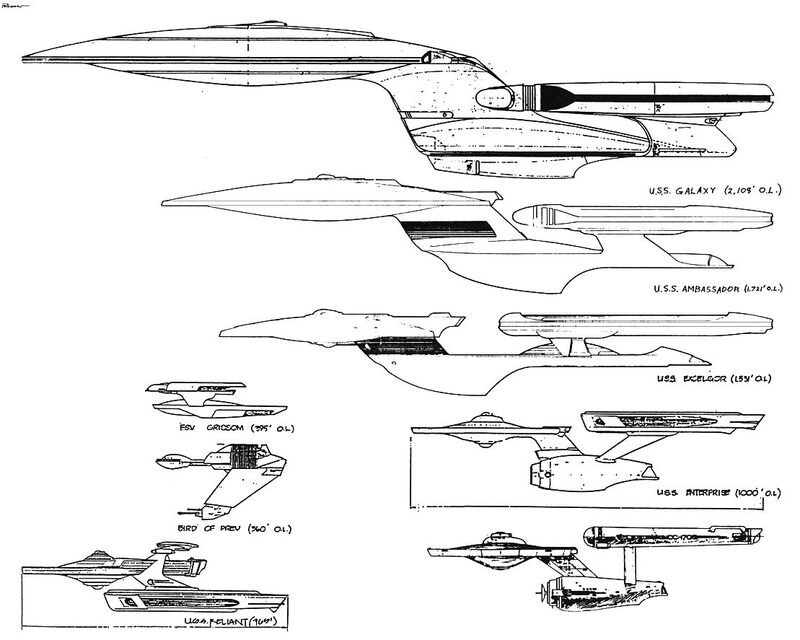 It may be worth mentioning that the Enterprise refit was designed to be exactly 1000ft (305m) long. It is possible that the Excelsior was intended to be exactly 1.5 times as long which was apparently slightly raised to 1.531 times when the model was completed. 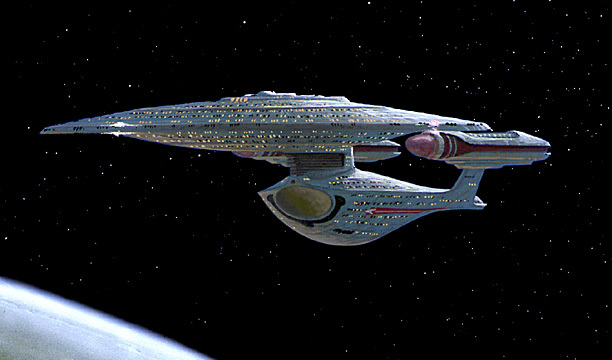 For what it's worth, the DS9TM, which unfortunately is among the most-quoted size references for the Excelsior class, gives us a length of 511.25m for the ship. Even though this increased size seems to be convenient as it may help to alleviate a few problems, it is nothing more than a calculation error. 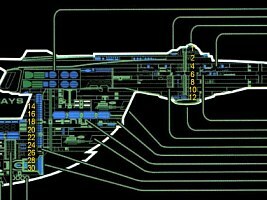 The rationale is that all dimensions in the DS9TM originate from the starship charts in the Star Trek Encyclopedia II, and here of all ships the Galaxy whose length of 642.5m was used as the reference, was depicted too small. Hence, the dimensions of most smaller ships increased. This is why I discard the 511.25m figure without further ado. There are hardly enough window rows in the engineering hull to allow an extraction of decks. Only in the saucer perimeter we can clearly make out two window rows and hence two decks. Actually, this part of the ship is quite reminiscent of the Constitution refit. 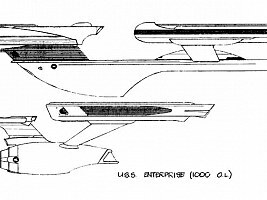 It seems that during the design process of the NX-2000, after a temporary deviation leading to radically different designs, the designer Bill George returned to the saucer structure known from the Constitution class. For the comparison of the Excelsior with the Enterprise refit I have intentionally used orthographic photos of the two studio models (note on both ships the openings for the motion-control mount), in order to avoid inaccuracies because of faulty drawings or renderings. If we compare the two saucer rims at 467m for the Excelsior (Constitution refit: 305m), we can see that only two low decks would fit into the Excelsior rim with its height of 6m (Constitution refit: 6.5m). The overall 3m for one deck would have to include the outer hull and possible Jefferies tubes. Their windows would be located rather close to the floor on the upper deck and close to the ceiling on the lower deck. This doesn't seem to make much sense, and we can only suppose that these details were worked out after the overall length had already been determined to be 467m. 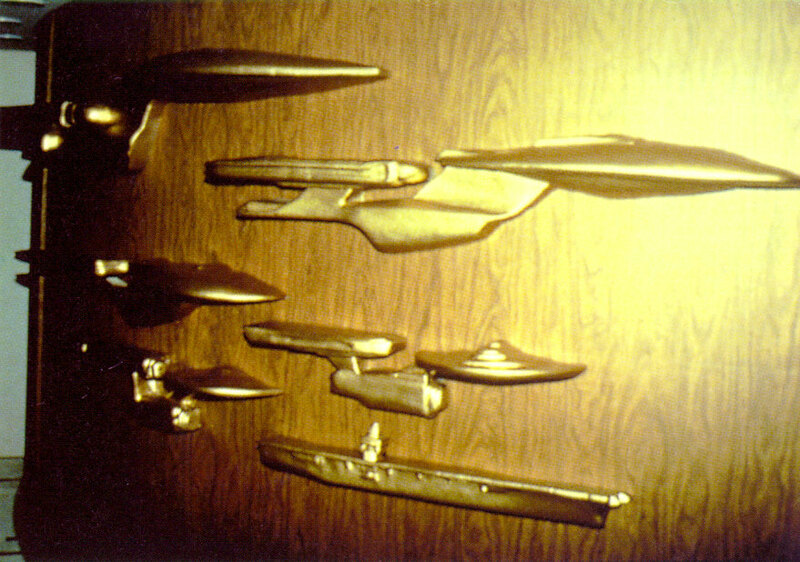 Before the USS Excelsior appeared as Sulu's ship in "Star Trek: The Undiscovered Country", several modifications were made to the existing studio miniature. Most obviously the registry was changed from "NX-2000" to "NCC-2000", indicating that the starship was no longer experimental (which is often interpreted in a way that the transwarp experiment failed, but this is just speculation). Aside from that there were detail changes as well. To start with, we can see that the rounded hull segment facing forward on the aft shuttlebay was replaced with an angular piece that is much more detailed and that looks like it has three decks. Also, the detail customarily known as impulse deflection crystal in fandom was removed and two smaller domes were added to the model instead of it. Clearly these detail modifications may be taken as signs of a now larger size of the ship. The most significant alteration was done to the bridge. 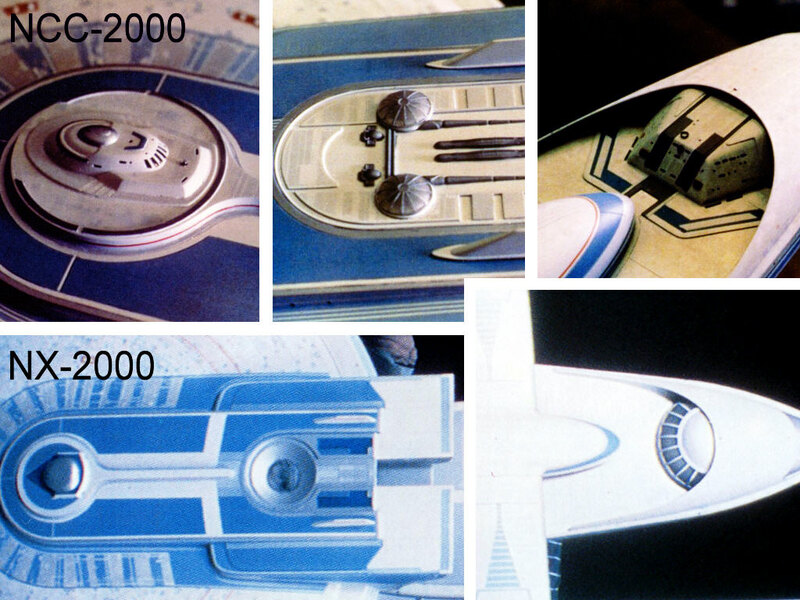 The original Excelsior NX-2000 already had a relatively small bridge dome, in any case not as big than its counterpart on the Enterprise refit. 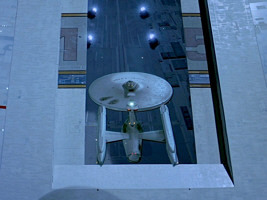 On the Excelsior NCC-2000 this bridge dome was replaced with a still smaller somewhat angular module. This new module looks like it is less than one deck tall, much too low for a bridge module which usually measures considerably more than a standard deck height. We could hypothesize that the bridge module is partially submerged into the hull though (an explanation that would also work with the Oberth class where we are facing essentially the same dilemma). The interiors of the two bridge versions are considerably different as well. We can easily see that the original NX-2000 bridge of Captain Styles is more spacious than Sulu's bridge on the NCC-2000 that is rather reminiscent of the crammed Enterprise-A bridge. NX-2000 bridge in "Star Trek III"
NCC-2000 bridge in "Star Trek VI"
In "Star Trek Generations" Captain Kirk is blown into space (actually into the Nexus) through a large hull breach on the Enterprise-B. We can see this hole in the secondary hull near the deflector from the outside. 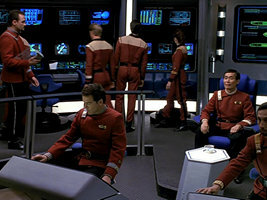 It is clearly discernible that three decks were ripped open; we can even see three people, namely Harriman, Scotty and Chekov, as they are standing behind a railing on the middle deck. 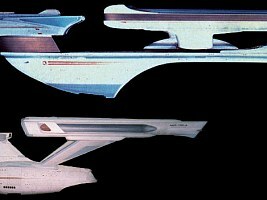 When we compare the portion visible on screen to reference photos of the ship, we find that the three exposed decks correspond with the widest part between the two sharp edges of the Enterprise-B's hull broadenings (that were attached for the particular reason not to damage the Excelsior model). The said part is not quite as tall as the saucer rim which would occupy just two low decks of 3m at 467m. Consequently, the overall length of the ship rises by no less than 50% to 700m if there are really three decks of 3m each inside the hull extensions. Enterprise-B hull extensions in "Star Trek Generations"
On the other hand, it was mentioned that Captain Kirk would go down to deck 15, and Demora Sulu later reports that the hull breach is on decks 13, 14 and 15. If we go by the MSD, which does have relatively low decks and hence basically points to a big Excelsior as will be analyzed further down, these decks would all be located in the neck, at least six to eight decks above the position of the hull breach that we see on screen. This is a clear error that was not fixed in the final shooting script according to the artwork of the MSD. So we have to ignore either the spoken dialogue, or the MSD is wrong and the structure of the decks is not as it looks in the close shot of the hull breach. In "Star Trek: The Search for Spock" we witness how the refitted Enterprise clears the not yet fully opened doors of Earth Spacedock. 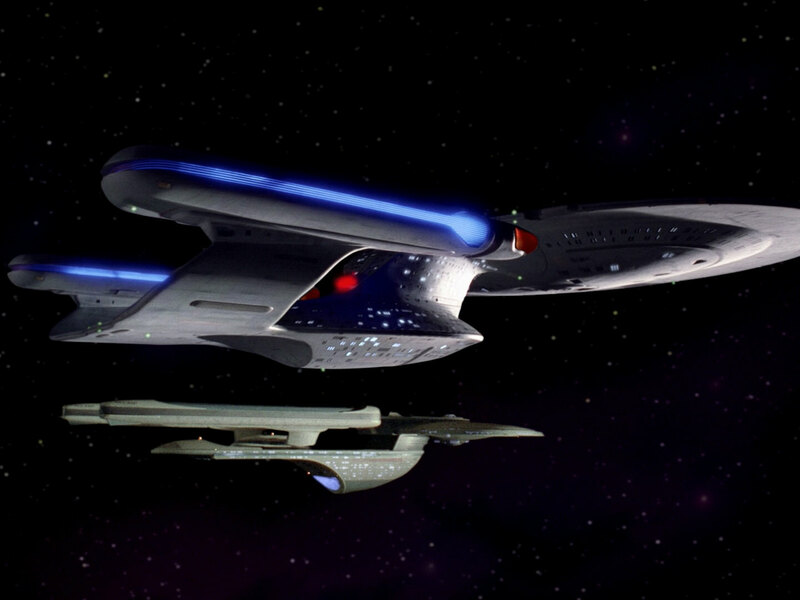 Only a couple of seconds later the Excelsior NX-2000 passes the very same door to pursue the Enterprise. Even though the doors are now fully opened, this is a delicate maneuver, considering that the Excelsior saucer at 467m length measures 184m across, about 33% wider than that of the Enterprise. The opening in the spacedock is roughly 245m wide, giving us an upper length limit for the Excelsior of 600m. Side note 1 I derived the 184m width from the saucer radius as visible in the orthographic side view. Based on the Christie's auction catalogue, on the other hand, we arrive at a width of just 162m. 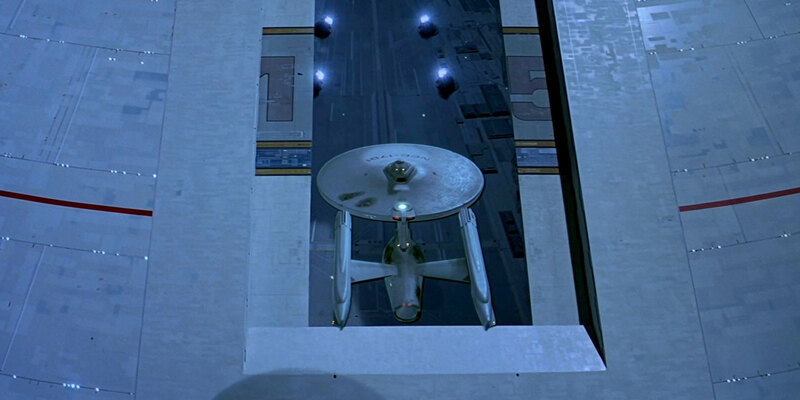 Side note 2 The size of the spacedock itself is under debate because the model was re-used for several other starbases that the Enterprise-D visited almost 100 years later. But at least as the Earth Spacedock is concerned, its diameter can be nailed down at approximately 3800m through the comparison with the refitted Constitution. Both ships, the USS Excelsior and the Enterprise-A, are moving towards the background at the end of "Star Trek: The Undiscovered Country". The Excelsior is clearly closer to the camera. Since its saucer appears considerably wider than that of the Enterprise-A, the scaling is correct, even if the distance between the ships is relatively long, but in such cases visual evidence is usually unreliable anyway. 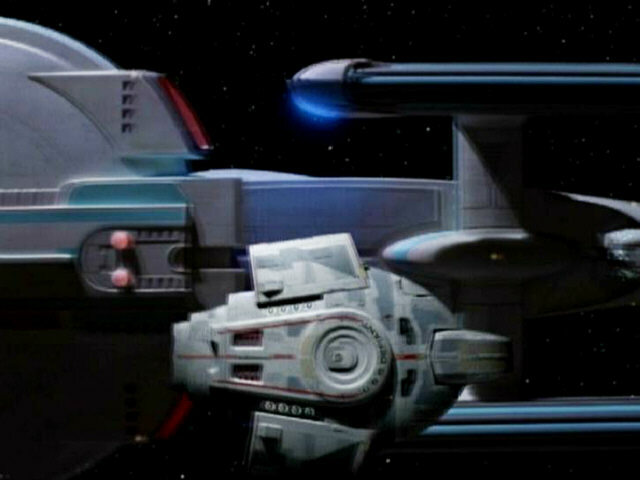 In TNG: "Encounter at Farpoint" the USS Hood moves alongside and eventually overtake the Enterprise-D, and the Excelsior-class ship does not look considerably smaller than the Galaxy when both ships are just aligned. 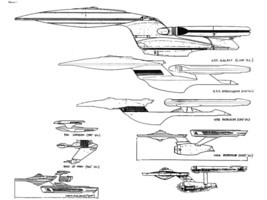 The true relative lengths are deceptive because the Galaxy class may appear bigger just due to its relatively much wider elliptical saucer (it is as wide as the Excelsior was supposed to be long!). In addition the Excelsior is an exceptionally elongated vessel. Hence, we may suppose that the Excelsior is 600m or even longer here. 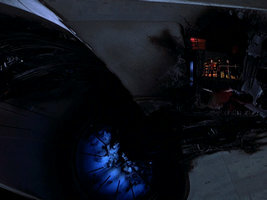 There is one other example of a large Excelsior during early TNG, namely the Fearless in "Where No One Has Gone Before". This is not astonishing, since the whole scene is stock footage from "Encounter at Farpoint", only the planet was removed. 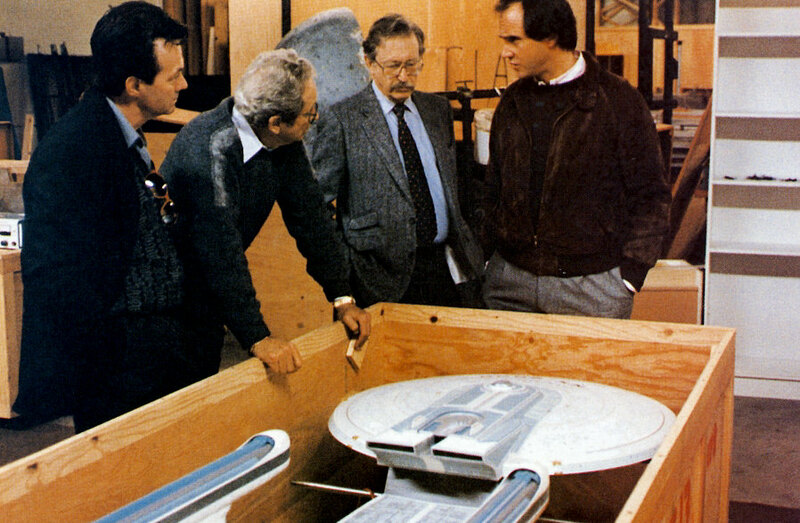 There may be a practical and almost trivial reason for the Excelsior having approximately the same length as the Enterprise-D. At the beginning of TNG a six-foot studio miniature of the Enterprise-D was being used. The original model of the Excelsior was even 7'7" long as mentioned on the occasion of the Christie's auction. In pre-CGI times the easiest way of getting the two models into one scene was making two identical passes with the camera or even filming both at once in the same setup. Later on in TNG the six-foot Enterprise-D model was replaced with a four-foot version (read at Trekplace) which was obviously not possible to be used at the same scale alongside the seven-foot Excelsior. Side note Another, more speculative reason for scaling up the Excelsior in the first TNG season may have been that Andrew Probert conceived a predecessor for the Galaxy as a regular "guest ship". But such a vessel was never built at full studio miniature scale. It can only be found on the Enterprise-D ship wall as well as on Probert's size chart that has already been discussed further above. The idea of a Galaxy precursor was finally put into action when Greg Jein built the Enterprise-C for TNG: "Yesterday's Enterprise", yet with substantial changes to Probert's original concept. Until then the VFX people may have mistakenly or purposely used the scale of this yet-to-build Enterprise-C for the Excelsior. in TNG: "Encounter at Farpoint"
in TNG: "The Child" et al. in TNG: "Drumhead" et al. In the course of TNG a second take of an Excelsior-class ship alongside the Enterprise-D was filmed for TNG: "The Child". 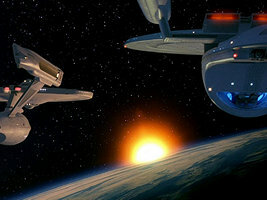 Showing the side view of the Enterprise-D in front of the Excelsior-class Repulse the whole time, it is too indefinite for a size estimation. We can see the very same take with modifications only to the background in TNG: "The Offspring", "The Best of Both Worlds", "Ethics", "Chain of Command", "Descent" and "The Pegasus". 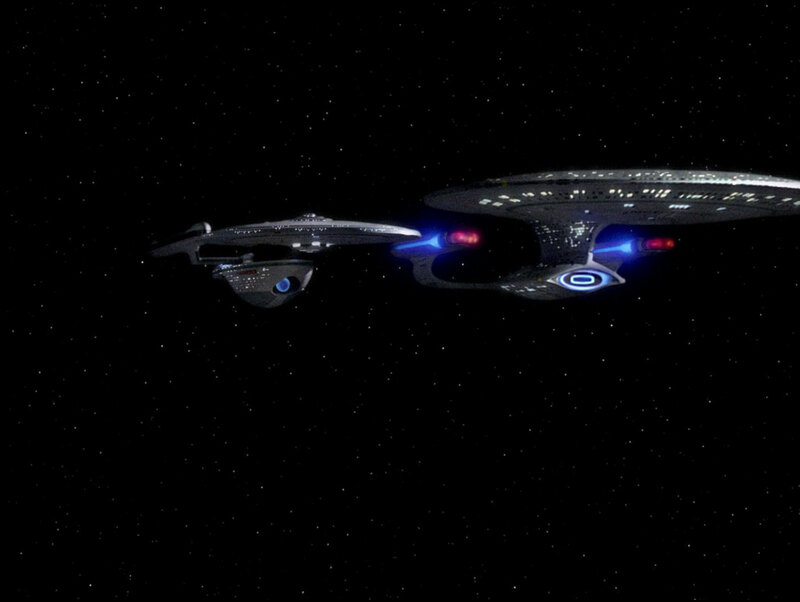 More interestingly, there is another encounter of the Excelsior class and Galaxy class that is shown frequently since the third season of TNG, the first time in "Tin Man". At the first glance it looks just like the take from "Encounter at Farpoint" where the Enterprise-D and an upscaled Excelsior are approaching the camera. But curiously the Excelsior doesn't appear too big here. And as we examine it closer we can see that the Excelsior is exactly like in "Encounter at Farpoint", while actually the Galaxy must have been newly inserted. The Galaxy is bigger here and it was shifted up relative to the Excelsior ship. Both ships move at the same speed here, unlike it was the case in "Farpoint" where the Excelsior class was approaching faster from the background. 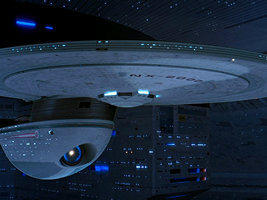 Moreover, for one moment we can see how the saucer of the Excelsior class overlaps with the Enterprise-D engines behind it, exhibiting a dark seam. 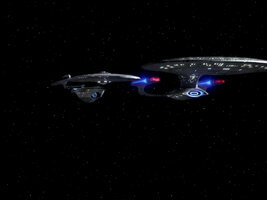 At this very moment the Excelsior class is ahead of a clearly bigger Galaxy class. 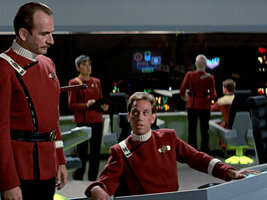 The reworked take was re-used in TNG: "The Drumhead", "Chain of Command I/II" and "Preemptive Strike". The Defiant is not exactly the best reference ship for size estimations, but the comparison of the Defiant and the Lakota (Excelsior refit) in DS9: "Paradise Lost" is just too tempting. We could certainly claim that the tough little ship should be 170m long, which could give us more than 600m for the Lakota. If we go with 120m for the Defiant, the Lakota is less than 500m long. in DS9: "Favor the Bold"
Little clear-cut evidence can be obtained from the appearances of the Excelsior class in the fleets of the Dominion War. 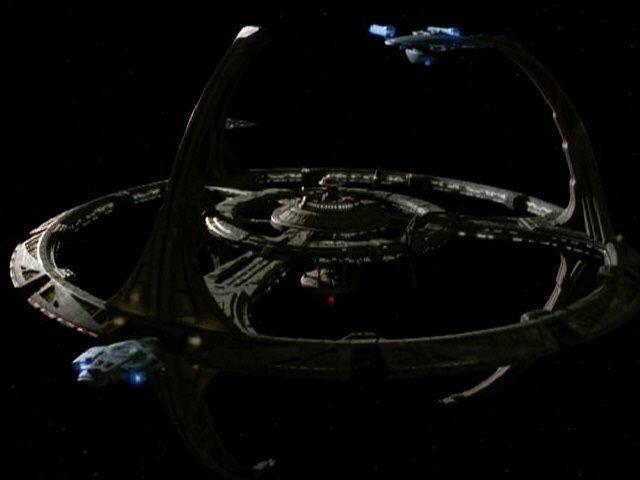 In DS9: "Favor the Bold", when the fleet assembles, there is a Galaxy class (one of two with a strange "dark neck") closer to the camera which does not look a great deal longer than the Excelsior at the "lower" end of the station. On the other hand, the Excelsior is scaled quite correctly relative to the nearby Miranda, so no definite statement is possible about the relative sizes. 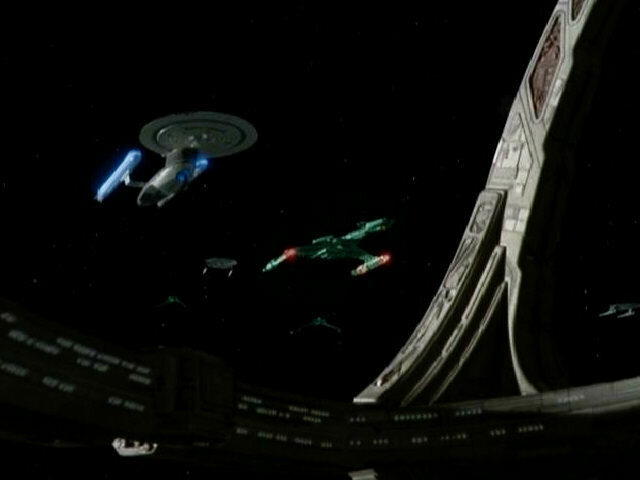 Essentially the same applies to almost all formation scenes where we may occasionally have slightly overscaled Excelsiors relative to larger ships like the Galaxy class or a Romulan Warbird, but then again the scale relative to equal or smaller vessel types like Miranda or Vor'cha is correct. 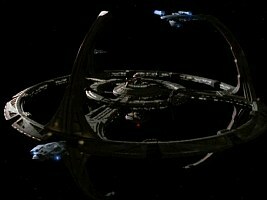 in DS9: "By Inferno's Light"
in DS9: "Chimera" et al. 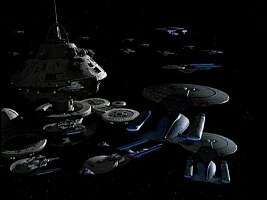 Like the Defiant too, the station has constantly been subject to more or less intentional scaling. Bigger ships such as most obviously the Nebula class in the opening credits and also the Excelsior are considerably scaled down whenever they dock at the station, making the latter look like more than 2.5km across (DS9TM: ca. 1.4km, and this is already scaled up). In one of the most frequently re-used pieces of stock footage of ships at the station we can see, besides the appalling USS Yeager, an Excelsior at the upper pylon. If the station is 1400m across, the Starfleet ship would have to be some 300m long which is of course impossible to fulfill. We may decide to ignore the size discrepancy and rather use the Nebula as a reference which appears at about the same length relative to Deep Space 9 and whose design length of 440m is close to the original 467m of the Excelsior. 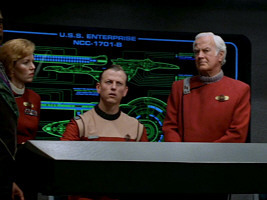 The most obvious evidence of a huge Excelsior comes from the master systems display (MSD) of the Enterprise-B as it was visible behind the station of the crewman played by Tim Russ in "Star Trek Generations". We can't really discern decks even on the DVD version of the movie, but if we look closely at the reproduction of the MSD, it shows no less than 34 decks on the ship. If this MSD were correct, the Excelsior class would be at least 100m high from the bridge to the keel, increasing the overall length of the ship to 680m or more! However, we have to bear in mind too that the hull breach was explicitly said to be on the decks 13 through 15, whereas the hole that we see would be on the decks 20, 21, 22 according to the MSD. 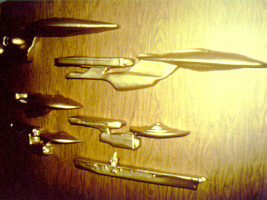 The ship wall with previous vessels named Enterprise has a depiction of the Enterprise-B of the Excelsior class. Since the wall was created for the first season of TNG as soon as 1987, whereas the movie "Star Trek Generations" was made in 1994, it is obvious that the depiction is inaccurate and shows a standard Excelsior, not the upgraded vessel we now know as Enterprise-B. We may excuse this little inaccuracy in the same fashion as we do it with the still more inaccurate interpretation of the Enterprise-C on the same ship wall. But irrespective of the version actually depicted, the Excelsior class on the ship wall is under 500m long, definitely shorter than the Ambassador class and considerably shorter than the Galaxy. Ship display in VOY: "In the Flesh"
In Species 8472's recreation of Starfleet Headquarters we can make out a wall chart with depictions of several starship silhouettes which are obviously meant to be at the correct relative scale. Here the Excelsior is at most 500m long compared to the Galaxy class. There is surprisingly strong evidence in favor of an Excelsior class much longer than the so far established 467m. We may give relatively little credence to most ship encounters because these are generally either indefinite or dubious for various reasons. A more solid basis is the structural analysis of the Excelsior which exhibits a few design flaws (most obviously the tiny bridge). These may be readily justified if we assume a larger overall size of the vessel. On the other hand, the exterior of the ship does not include any details that would inevitably require a substantial revision of the ship's size. 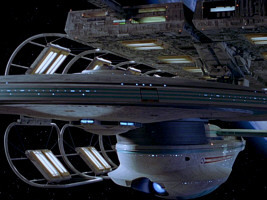 Only the hull breach spanning three decks in "Generations" would allow no other workaround. 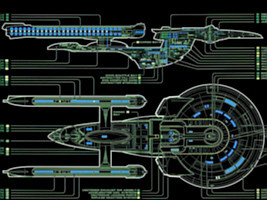 Finally, there is the MSD of the Enterprise-B that includes so many decks that the ship would have to be 700m long. Regarding this evidence and the considerable scaling error there is quite obviously no compromise along the lines that the ship could be half-way between 467m and 700m. We either have to ignore or re-interpret the hints to a larger ship, or take them as the only true evidence. The 467m length is still supported by various evidence. Leaving the erroneous DS9TM aside, all official sources and most importantly the designers tell us that the starship class is 467m long. With regard to screen evidence, with only one notable exception in "Encounter at Farpoint" we never get the impression that the ship could be substantially longer. Finally, there are two quite subjective reasons to still adhere to the 467m Excelsior. The first is that the design aesthetics work best at this size, considering that a number of features, most obviously the saucer perimeter, are like on the Constitution refit and their sizes should be comparable even if we have to make the unusual assumption that that the bridge is submerged. It is frankly problematic that the windows in the saucer rim don't perfectly correspond with two decks at 467m length, but they would fit even much worse if there were three decks (or two tall decks like on the MSD). The second reason is that a 467m Excelsior would fit well into the design lineage. It would require a 700m Excelsior to comply with the MSD and with the decks in "Generations". Such a ship would be a monster, being bigger than the Ambassador and the Sovereign class. Not to mention the various ugly Excelsior kitbashes which would grow likewise. These considerations have led me to the judgment that the Excelsior should better remain 467m long. 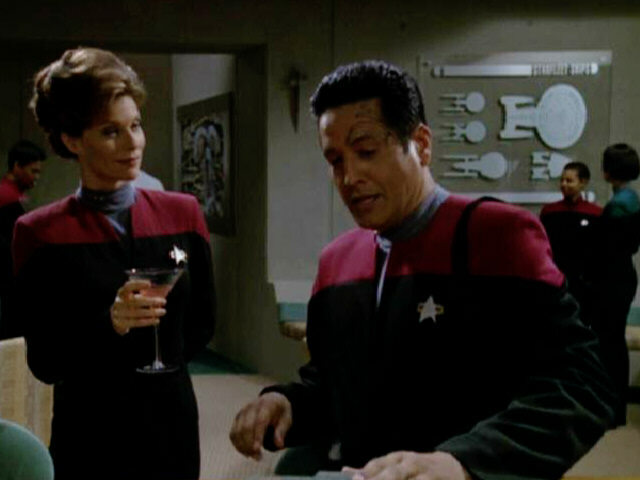 The issue of the Excelsior size was brought up in the SCN Forums. Special thanks go to Mariner Class for his suggestions. Thanks a lot also to Jörg for a large number of screen caps and some valuable observations, to John Shanks who noticed an inconsistency (meanwhile corrected) in the Enterprise-B MSD and to dbdooley97236@yahoo.com for the exact length and width of the filming miniature.